Today, my girlfriend and I celebrate our 1st Year Anniversary and being the sweet and loving girlfriend that she is, she decided to let me choose a PS3 game that she would buy for me. I chose this game, because I had been looking to get this for quite sometime now but never got around to doing so, lucky for me, my timing was right as the GOTY Edition has already been released, this means for little extra amount of money, I get bonus content for free! This includes the following: Harley Quinn's Revenge DLC, Catwoman Pack, Robin Bundle Pack, Nightwing Bundle Pack, Arkham City Skins Pack and a Challenge Map Pack. All this included in a game 200 bucks (PhP) more than the original/standard one. 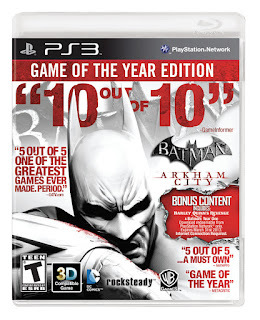 Now the folks at Warner Bros. Games and Rocksteady have went all out on this game which is the direct sequel to the amazing first chapter of the Batman franchise which is Batman Arkham Asylum. Now for those who played the first installment, you would know that it had a pretty dark setting going about it and for Arkham City, things got a little bit darker. And that's something would be expected, just picture this: Gotham's baddest of the bad, all in one place, a prison the size of a city, within Gotham City. We don't start off straightforwardly as our famed caped crusader, but instead, you start off as Bruce Wayne, trying to make a little protest against the presence of Arkham City, this doesn't sit well with it's "Warden", Professor Hugo Strange disrupts his speech using his personal army. You eventually wake up dazed within the walls of Arkham City. But of course, being the hero, you get to a point wherein you eventually get geared up for action. Apart from this, you also have the opportunity to play a bit of a side story as Catwoman in various parts of the game. Similar to Arkham Asylum, the area of play is quite vast and almost fully explore-able. The map is vast and the to make you feel like you are actually going around an entire city. You also get to experience some weather effects which add to the graphical architecture of the game and this also adds to the feeling like you are moving within a big and dangerous city. The fun from the previous game hasn't changed and I'm referring to the straightforward jump in the middle of battle and beat everyone who comes within reach. Or go for the stealthy approach and pick the bad guys apart little by little striking fear with every stealth takedown. Free flow combat has also been retained and improved as well with some nifty new moves and takedowns. And the enemies aren't as dumb as you'd make them out to be because the foes here now have access to firearms and various weapons that they can just run and pickup despite temporarily disarming them. This means taking on the bad guys involves a little bit of strategic thinking. 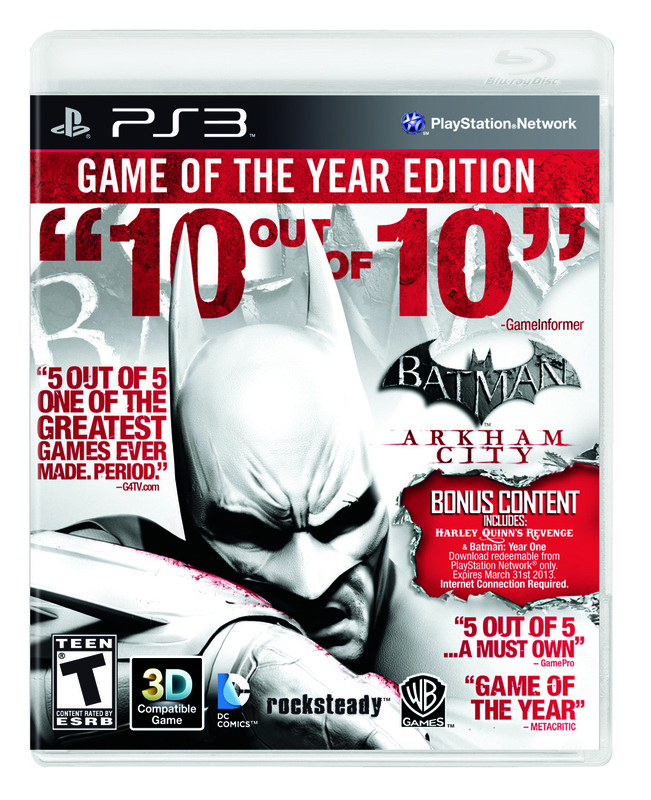 The gear and the moves definitely will not disappoint players, as it seems that Arkham City has taken best or good bits and pieces from the entire Batman franchise and put them all into one solid game or in this case, one solid character. The storyline is something that was well thought out, simple yet complicated and apart from the main storyline, of course you have the various side missions, ranging from saving political prisoners, to saving Riddler's kidnap victims by solving his riddles, to tracking down Victor Zsasz by dashing throughout the city and catching ringing payphones to save victims. These side missions give the game a high replay value, plus the DLCs included will definitely prolong your adventure in this game. Getting around Arkham City is pretty fun, you pretty much glide and grapple hook your way around town. Although I wish they would have thrown in the Batmobile just for the heck of it, it is after all the iconic vehicle of Batman. But overall, in my opinion, this game could be considered an ultimate game. Simply put, it is like a movie wherein the player is interactively involved, the audiovisual aspect of the game is thoroughly pleasing and the storyline offers depth and intensity. Overall: I think this game deserves a 10/10. The story is intense and deep and the gameplay is very fluid and action packed. The replayability of the game is also very high due to the fact that there are various sidemissions as well as DLCs make the game very long and interesting.